Part of the problem of getting the ever-thrill-seeking youths to buy the Nissan Leaf was, apparently, the non-aggressive nature of the car. 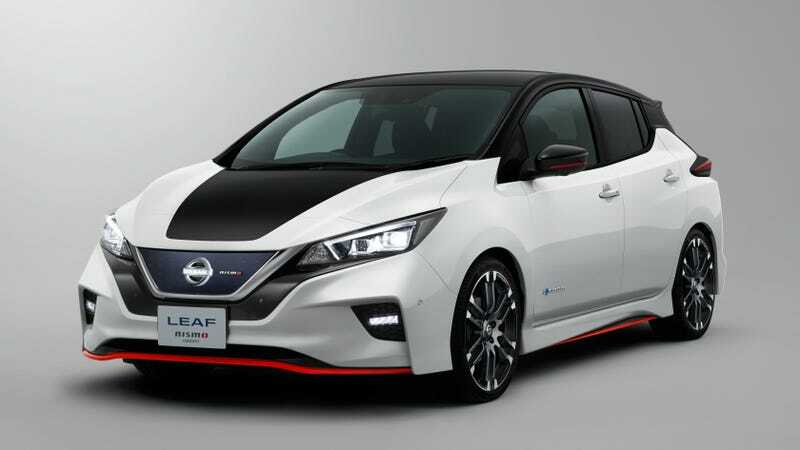 Nissan is looking to change this by supposedly upping the aggro on the new Leaf with a Nismo version of it. Update: this post has been updated with an official Nissan statement and photos. A photo of the Nissan Leaf Nismo concept was shown at Nissan Futures event. You can see a black hood, a puffed out front bumper, sculpted side skirts and different wheels. get greater accessibility of the market. It’s unclear if the production version Leaf Nismos would benefit from engine upgrades as well, or just the aesthetic ones seen in the Tweet above. We already know that Nissan is looking to double its yearly Leaf deliveries with the new model. And that it will try and spice up its lineup with more Nismo offerings. Perhaps this is one of the ways the company is going to try and accomplish those goals.